WHAT'S IN YOUR WALLET WAYNE WILLARD? With Our Help, It Is Now A Lot Less Thick!!! USAR License Card – "I try to keep it with me. I don’t know if we have to or not." Company VISA Card – "That is the fun card." Second Company Credit Card – "This one is old. (Editor's Note: Remember This) It is used up. I guess that is why we have a new one." Personal Bank Card – "That one was obviously tucked behind the others so I don’t use it as much." Is that a license photo or a mug shot? 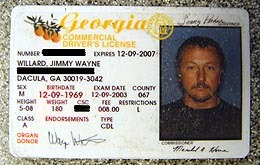 Georgia State Driver's License – "It's an ok picture. I really don’t care about pictures like women out there do. It is just a license." Home Depot Gift Card – "I try to be big on home improvement and stuff around the house." Health Card – Something to keep with me, especially for what I do. Fourth Home Depot Gift Card – "I’m a Home Depot fan, not a Tony Stewart fan. I guess I like to go there, I just don’t use my gift cards too often." 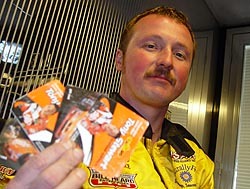 Wayne says he's not a Tony Stewart fan, but he sure has a lot of unused Home Depot Gift Cards. $105 Cash (A $100 bill and a $5 bill) - "That is all. I guess I don’t have much. I'm broke"
Old Credit Cards – "These are just old credit cards of mine that I haven’t torn up yet that need to be discarded. I don’t know why they are in there. They need to be thrown away, I just don’t do it I guess. I can't believe i have this many of them." Freddie Query Business Card – "I try not to talk to him, but sometimes we talk and share information." Lucky Seven Crossroads Bar & Grill Free Appetizer Card – "Cause I had bad service there one time." We helped Willard weed out all kinds of old cards that were no longer good. And yes, he got rid of them. Another Old Credit Card – "This is just another card. It expired in 2003. I guess I can discard that. 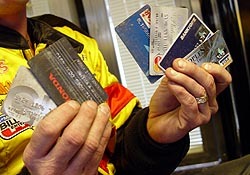 I’ve got so many old credit cards in there, I actually have imprints of all the number into the wallet." Old Honda Card – "This one is even cracked and falling apart. It is no good." Another Old Credit Card - "OK, this is getting out of hand, I didn't realize I had so many old cards in here." Tax ID Number – "That is just a important, boring piece." If you are living and breathing and you call yourself a Short Track racefan and you live in the Southeast, you've likely heard of Wayne Willard. 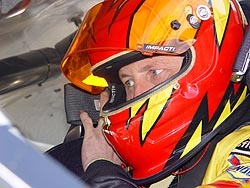 For years, Wayne was a mainstay in the Super Late Model ranks around the Southeast and all over the country. He won race after race at track after track. He won them all, except two of the biggest, the Snowball Derby and the All American 400. You ask and you shall receive. Yes, one of the most popular features from 2004 has found its way over to 2005. Once again this year, sporadically throughout the year, we will take the time and ask Short Track drivers around the country “What's In Your Wallet?” This is a no-hold-barred, “You have no time to clean it out” look as to what Short Track drivers keep in their wallets. rookie, racing some of the most talented 20-somethings in the country. Willard is kind of a quiet guy. He takes it as it comes and goes about his business, letting his driving do the talking. So when Speed51.com approached him and yelled "Give Me Your Wallet," he was a little apprehensive. But now that it is all over, he can be very happy, because thanks to Speed51.com, his wallet could very well be a few pounds lighter. So Wayne Willard... What's In Your Wallet? SCS Gearbox Inc. Gear Chart – "I have it in my wallet so instead of running in the trailer all the time, I can pull it out and look at it. (Speed51.com asks “Do you normally keep your wallet on you at the racetrack?”) Well, no, so I guess that makes no sense huh?" Finishline Fabrication Business Card – "Yeah, that isn’t good. They are a big competitor to Port City South. Oh well, it is just a business card." Second SCS Gearbox Inc. Gear Chart – "Another pointless gear chart thanks to what you taught me." Chuck Schmick Business Cards – "I’ve got deuce of those as well." 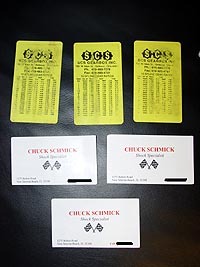 Another Chuck Schmick Business Card – "Well, I guess I have three." Three gear charts and three Chuck Schmick business cards? Why Wayne?